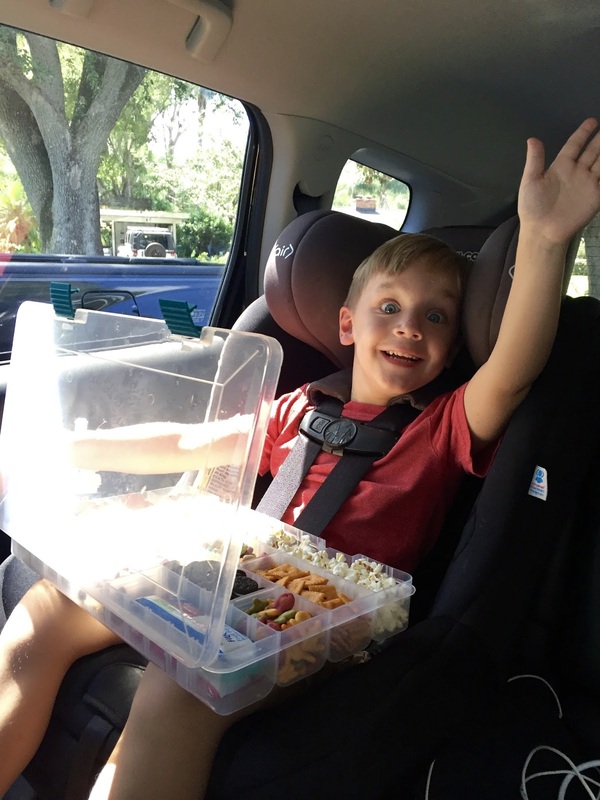 I found this idea on Pinterest and decided to surprise Tommy on our way to Vero Beach with his very own, custom made snack box! I found the box HERE, and set out to fill it with half salty and half sweet treats. I also tried to make it as colorful as possible because kids LOVE color! In the beginning I was going to go as healthy as possible, but scratched that idea, because what is vacation without indulging in some sugary snacks right? Tommy LOVED his box, which also can doubled as a little desk for drawing and projects in the car. And, it was a huge lifesaver at the hotel, where a simple Snickers bar is $8! Yes, you read that correctly. As soon as we arrived in our room, we put the hotel snack tray in a cabinet and replaced it with Tommy's snack box which we all dipped into the entire trip. The box is great for adults too! Here he is when he first got his box! Have a great week everyone, and thanks for reading!